* Our must-have magnificent 6 1/2" long x 9/16" w 14K Gold plated Cubic Zirconia Bridal Bracelet boasts 7 brilliant Cushion CZ's framed with delicate pave. 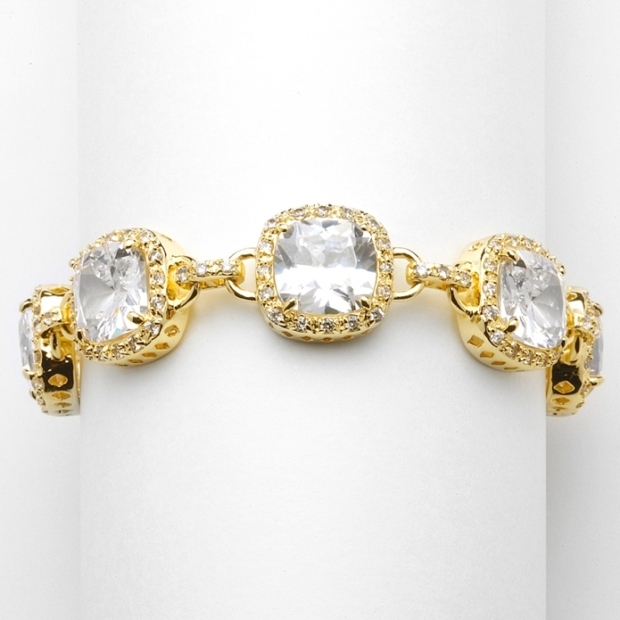 * Our exclusive designer bracelet is a best seller for brides, mothers of the bride and pageants. * This regal petite length 14K Gold plated bracelet is a best-selling must-have addition to every bridal stockist or retailer's wholesale wedding jewellery display. * With its fine jewelry style safety clasp, this bracelet looks like genuine diamonds. * Pair this best selling "statement" bracelet with Mariell's coordinating earrings 4069E-G and necklace 4069N-G for a dramatic ensemble. * Your customers will look like they stepped out of a 5th Avenue Jeweler! * We also offer this bracelet in an 8" length sold as style 4069B-G-8.